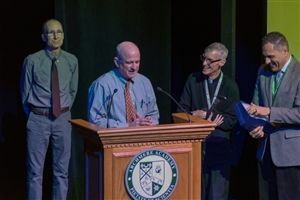 On Thursday, January 31, 2019, Archmere Headmaster Dr. Michael Marinelli '76 presented Rev. Joseph McLaughlin, O.Praem the Carl Campion Service Award during the Catholic Schools Week Assembly. This award recognizes a (current/former) factulty/staff member’s devoted and exceptional service to the Archmere Academy community. 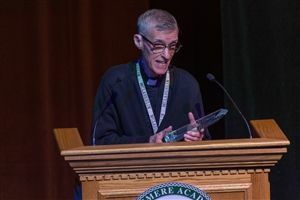 The award is an opportunity to acknowledge an individual whose work ethic, humility, integrity and spirit have made the Archmere community a better place over time. 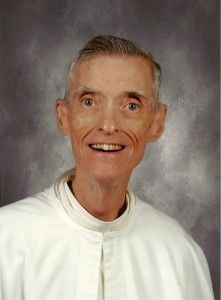 Father McLaughlin's service has been integral in furthering the school’s mission and in creating the unique, welcoming place that is Archmere. A Philadelphian by birth, Rev. Joseph McLaughlin, O.Praem attended St. Aloysious Grade School in Bryn Mawr and St. John Neumann High School in Philadelphia. In August of 1962 he entered the novitiate of Daylesford Abbey, Paoli, to begin his priesthood studies. Having received a Bachelor’s degree from St. Norbert College in DePere, Wisconsin, he studied at both St. Norbert Abbey and Daylesford Abbey. He holds a Master’s in Religious Studies from Villanova University and a Master’s in English from the University of Wisconsin. Prior to coming to Archmere, Father McLaughlin’s assignments included teaching at St. John Neumann High school and serving as the Master of Novices at Daylesford Abbey. After his ordination on May 1, 1970, his first assignment was teaching English at Archmere Academy. Throughout his career at Archmere, Father also taught speech and a religion course titled “Marriage and the Family,” and served for one year as a Prefect of Boarders and as Campus Minister. On June 3, 1983, Father McLaughlin was named Archmere’s Fifth Headmaster, succeeding Rev. Justin E. Diny, O.Praem. At that time, a new organizational structure was being put in place at Archmere, and his position filled the roles of both Headmaster and Principal. 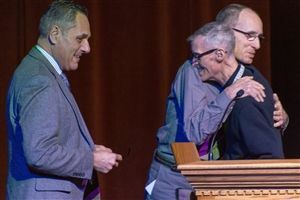 The new administration consisted of three deans, under the direction of the headmaster, who were under the supervision of the Board of Trustees. During Father McLaughlin’s first term as headmaster, he was instrumental in forming a long-range planning committee along with the then Director of Development and Archmere’s current Headmaster Michael A Marinelli, Ed.D. ‘76. The committee of twelve included members of the Norbertine Order, faculty, administration, staff and alumni, and functioned as the “core” planning group, with five task forces focusing on specific areas of the school. The planning committee reviewed historical information, evaluated the school’s strengths and weaknesses, identified issues for discussion, and articulated the mission of the school. As a result of the issues raised in the long-range planning process, an outside consulting firm was then commissioned to do a space study of the campus, and recommendations were made concerning the optimum utilization current facilities and suggestions for possible campus expansion projects. Father McLaughlin’s guidance and foresight in formulating this committee led to the creation of a blueprint that would guide Archmere into the twenty-first century. Under the McLaughlin administration, Archmere saw a period of growth both in the student population and in academic standing. Father McLaughlin’s first term as Headmaster ended on June 30, 1996. At that time, he returned his full attention to Daylesford Abbey, serving the community in a variety of roles including vocations director. He returned to Archmere in 2001 as head of campus ministry and the school’s chaplain, a position he had also held from 1982-1983. On July 28, 2006, the Board of Trustees announced Father McLaughlin’s appointment as Archmere’s headmaster for a one-year transitional period. At this time, the Board had been studying options for modifying Archmere’s leadership structure. Father McLaughlin again led the charge to develop an ad hoc committee for proposing a governing structure, from which was born the headmaster/principal structure that is still used today. Archmere had previously functioned under such a structure from 1970-1983. On December 4, 2006, Father McLaughlin was asked by the Executive Committee of the Board to consider an extension of his term as headmaster beyond June 30, 2007, to June 30, 2010. The request was approved by the Abbot and members of the Corporate Board and willingly accepted by Father McLaughlin. During his second term as headmaster, Father oversaw the completion of the capital campaign that began in 2002 and the start of campus renovations. He continued to pursue goals set forth by his predecessor Rev. John Zagarella, O.Praem (headmaster from 2004-2006), which included reaffirming Archmere’s catholic and Norbertine identity. On June 30, 2010 he completed his second term as headmaster and on July 1, 2010 began serving as Archmere’s director of mission and heritage, and as chaplain. As chaplain he offers a daily mass in the school chapel, and has had opportunities to get involved with student ministry and retreat, in addition to leading the annual Mothers’ Guild rosary adoration and participating in alumni masses and events. Father McLaughlin continues to celebrate marriages for alumni and baptisms for their children.